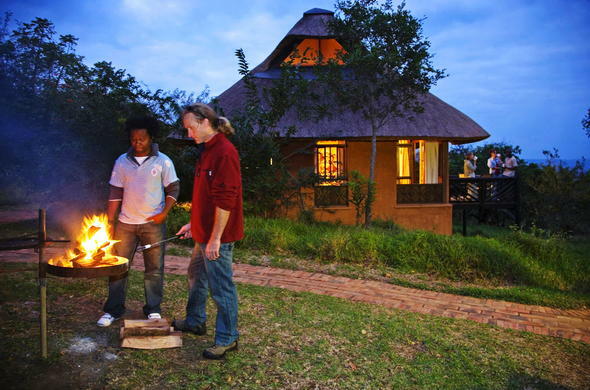 Hluhluwe Game Reserve offers a range of Kwazulu-Natal accommodation. These range from luxurious lodges to self catering units. KwaZulu-Natal accommodation at Hluhluwe Game Reserve includes lovely lodge rooms, self-catering units, chalets and luxury bush lodges where there is a resident chef. Meals are offered in the a la carte Mpunyane Restaurant and drinks can be enjoyed in the attractive pub and lounge. The award-winning Hluhluwe accommodation in KwaZulu-Natal offers visitors breathtaking views of the surrounding countryside. The oldest camp in Kwazulu-Natal, the Hilltop Camp was rebuilt and enlarged in the nineties, providing accommodation today that ranges from a luxury lodge to self-catering facilities. The ranges of accommodation at Hilltop Camp in Hluhluwe Game Reserve include 20 two-bedded rondavels (round huts) with communal ablutions and kitchens; 7 two-bedded and 22 four-bedded self catering chalets. Another 20 two-bedded chalets are within close proximity of the main reception area. These chalets are not self-catering. All facilities are serviced daily. The main reception area includes an a la carte restaurant, an attractive pub and a lounge decorated with memorabilia and photographs of the history of Hluhluwe. There is also a gift shop and convenience store. The Mpunyane Restaurant offers full English buffet breakfast daily with a la carte lunches Monday to Saturday and a hot and cold buffet on Sundays. Depending on the weather, dinners at this Hluhluwe accommodation are either a hot and cold buffet or a traditional barbeque (braai). Dinner arrangements change according to guest profiles and holidays. Guests at Hilltop also have access to a forest trail. The Hlaza Hide was developed at the site of the old summerhouse in Hilltop Camp and will soon include a waterhole with soft lighting to aid game viewing at night. Close to the renowned Hilltop Camp, Mtwazi Lodge is nestled under a large Sycamore fig and boasts its own secluded bushveld garden. This 8-bed lodge was once the original home of the warden of the game reserve and features memorabilia from Hluhluwe's rich history. This lodge at Hluhluwe comprises of three en-suite bedrooms and an annex bedroom with its own shower and toilet. A large lounge and dining room leads out into a generous flagstone veranda and a lush tropical garden shaded by trees. Mtwazi Lodge is a self-catering facility and is serviced once a day. Visitors have the option of eating in the camp restaurant. Both Muntulu and Munyaneni Bush Lodges consists of 4 seperate en-suite bedrooms with secluded verandahs overlooking the Hluhluwe River. There is a central viewing lounge and a kitchen complex. Muntulu and Munywaneni provide complete privacy and accommodate up to 8 people. Guests can make use of a cook / caretaker and a field ranger is available to take visitors on walks. Hluhluwe Game Reserve accommodation options range from luxury bush lodges to rondavels (round huts) and self-catering options. Enjoy a tranquil stay in the middle of the KwaZulu-Natal wilderness. Hluhluwe Game Reserve takes full advantage of its rich cultural history. This is reflected in the décor of the various accommodation options at this Zululand game reserve in South Africa.